Western Digital has launched the world’s biggest hard drive which weighs in at 14TB and uses 4th-generation HelioSeal tech. The HGST Ultrastar Hs14 is aimed at the likes of data centers and heavyweight cloud applications, with the helium-filled drive offering 40% more capacity than its predecessor – and double the sequential write performance. As well as helium, it also utilizes 2nd-generation host-managed SMR to help push that capacity, and also to drive new levels of power efficiency. According to Western Digital, the Hs14 consumes 5.2W at idle (6.4W in typical operation) and boasts a 60% lower idle wattage/TB compared to 8TB air-filled drives. Of course, this isn’t a drive aimed at your average user – as mentioned, it’s targeted for the data centre and enterprise usage – but it still shows how quickly things are moving in the HDD world. Consumers will benefit from the trickle-down of this enterprise tech eventually, and helium drives will eventually hit the mainstream. As an enterprise drive, reliability is also a big selling point with a claimed 2.5 million hours MTBF (mean time between failures). Mark Grace, senior VP of devices at Western Digital, commented: “Over 70% of the exabytes Western Digital ships into the capacity enterprise segment are on helium-based high capacity drives and continue to support customers with outstanding reliability, performance and value Quality of Service (QoS). 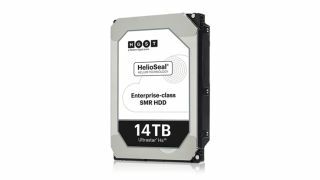 The HGST Ultrastar Hs14 comes in SATA or SAS models with a five-year warranty and is sampling to OEMs right now, with the exact price and availability to be confirmed. This may not be the largest hard disk on the market for too long, though, given that Seagate expects to release a 16TB hard drive next year.